The game manual featured some fairly modest hand-drawn art. 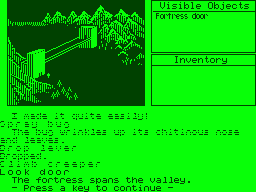 Inspired graphically and thematically by the Ultima series, The Seventh Link is probably the most extensive and full-featured RPG for the TRS-80 Color Computer. A single starting character ultimately enlists a group of allies of different races and classes on a quest to save their planet from a black hole at its core, about to break its containment. Solving the quest will take the party through dozens of towns across multiple planets and through multiple large, multi-leveled dungeons. 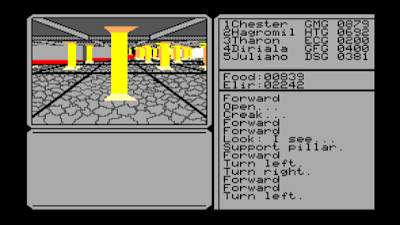 Although the game gets off to a slow, grindy start, character development is rewarding and the tactical combat system (drawn from Ultima III) is most advanced seen on this platform. The problem is that the game’s content is not up to its size, and not enough interesting stuff happens while exploring the enormous world. I never like giving up on games, and I particularly don’t like when I know the author is reading (I’m frankly not sure it’s ever happened before). But in several months of trying, I simply haven’t been able to make any decent progress in The Seventh Link. That doesn’t necessarily mean I don’t like it. If I was a Tandy Color Computer 3 owner, I’m sure I’d prize the game and play to the very end. The problem is that as a blogger, I have to be able to justify my playing time with material. If I spend four hours in a dungeon and all I can say is I killed a bunch of enemies (showing the same combat screens I’ve shown before) and gathered some gold, it’s hard to countenance that time. 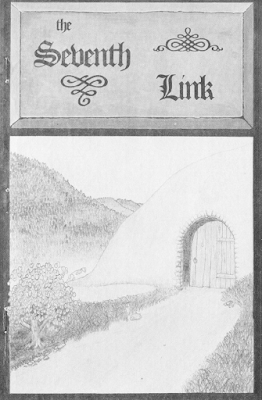 In some ways, The Seventh Link is the quintessential 1980s RPG. It offers a framing story with more detail than appears in the game itself, sticks the player in a large world that the player has to map if he’s to make any progress, and features a lot of combat. In mechanics, it’s as good as any of the early Wizardries or Ultimas. Unfortunately, Link was the last game I encountered before leaving the 1980s, and I’d just spent a decade mapping featureless dungeon corridors. It’s not its fault that it’s last; that’s just the way it happened. And by the time I got to Link, I just couldn’t do it anymore. I couldn’t–I can’t–play a game that’s just a few dozen 20 x 20 dungeon levels full of combats. The Bard’s Tale and its derivatives drained that battery. I never figured out anything to do with the pillars. This is the 90s, and gamers are demanding more interesting content in their game worlds. We want NPCs, special encounters, puzzles, and other features in those dungeons, at regular intervals. We’ve decimated forests in our consumption of graph paper; we’re ready for automaps. Ones that don’t require us to find a spell first. Despite investing a fair number of hours into the game, I really didn’t accomplish much. I explored the surface of Elira, visited each of its towns to assemble a party, and mapped 4 of 13 levels of one dungeon. 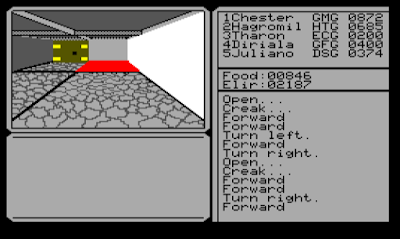 There were at least 9 more dungeon entrances on Elira alone, some of which would have taken me to teleporters to three other planets and their own towns and dungeons. I would have found a final party member, a female ranger named Starwind, on the planet Dulfin. Others dungeons would have led me to power packs and the places where I needed to install them to save the planet. I still don’t know where I was to find the other spells. From hints in an old disk magazine, I learned that the maximum character level is 25 (my main character reached 8) and that one of the planets has a store where you can buy potions that increase attributes, serving in the role of Ambrosia from Ultima III. One of the few lines from an NPC. Alas, I will probably never explore Selenia. 4 points for the game world. The sci-fi origin story is fairly original, and well-told in epistolatory fashion, although it fails to explain a number of aspects of the world (e.g., why are there settlements on other planets). While the player’s role is somewhat clear, it’s less clear where he came from, how he got started on this path, and whether he understands his role. 3 points for character creation and development. The selection of races and classes is familiar but not entirely derivative. There’s nothing special about character creation or the development and leveling process, but they’re reasonably rewarding. I don’t know if the level cap would have caused any issues or if you finish the game well before reaching it. 3 points for NPC interaction. The game has a better system than it uses. You learn a few things from NPCs, but there are hardly any NPCs that say anything to you. Expanding that number would have resulted in a richer, more engaging world. I do like the Ultima IV approach to assembling your party by finding members in the towns. 2 points for encounters and foes. The monsters are mostly derivative of other games (though I like the explanations for their names here: the ship that populated the planet had Tolkien fans on it), and I didn’t really experience other types of encounters. 4 points for magic and combat. The tactical combat screen is about as good as Ultima III, but with fewer spells. 3 points for equipment. You can get melee weapons, missile weapons, armor, and adventuring equipment like torches and keys. Various sites hint at more advanced items like rods and gems of seeing. The selection of stuff is a little paltry in the traditional Ultima style. 5 points for the economy. It lacks a certain complexity, but money is certainly valuable. You almost never have enough keys, for one thing. Healing, torches, equipment, and leveling up consume gold fast, and it sounds like the shop on Dulfan would have served as an endless money sink for any extra you could accumulate. 2 points for a main quest with no side-quests or quest options. 4 points for graphics, sound, and interface. Almost all of that is for the interface. It adopts the Ultima standard of one key per action, which ought to have been mandatory as far as I’m concerned. Graphics are functional but sound sparse. I never quite got used to the perspective. That lava square is only one square in front of me. 2 points for gameplay. It gets a bit for nonlinearity and a bit more for the moderate-to-challenging difficulty. But it’s not very replayable and it’s way, way, way, way too big and too long. That gives is a final score of 32, which is hardly awful for the era. It’s actually the highest score that I’ve given to the platform. The only things that stop me from finishing it are the number of hours it will take and the number of other games on my list. The Georgetown, Ontario-based Oblique Triad was a mail-order developer and publisher, co-founded by Jeff Noyle and Dave Triggerson. The name referred to the decorative bars on the top of a Color Computer. Mr. Noyle used to host a page (available now only on the Internet Archive) with links to their games, which included a pair of graphical adventures called Caladuril: Flame of Light (1987) and Caladuril 2: Weatherstone’s End (1988); a strategy game called Overlord (1990); an arcade game called Those Darn Marbles! (1990); and a sound recording and editing package called Studio Works. Caladuril, the company’s first game, is a decent-looking graphical adventure. With the Color Computer in serious decline by 1990, Oblique Triad shifted its focus to specializing in sound programming, and both Noyle and Triggerson have associated credits on Wizardry VI: Bane of the Cosmic Forge (1990) and Wizardry: Crusaders of the Dark Savant (1992). I haven’t been able to trace Triggerson from there, but Noyle got a job at Microsoft in 1995 working on Direct3D, DirectX, and DirectDraw and remains (at least according to his LinkedIn profile) there today. He also has a voice credit for a Skyrim mod called Enderal: The Shards of Order (2016). Mr. Noyle was kind enough to not only comment on one of my entries, but to take the time to create overworld maps to speed things along. I’m sorry that it wasn’t quite enough, but every game that I abandon stands a chance of coming back when circumstances are different, and I’ll consider trying this one again when I feel like I’m making better progress through the 1990s. PREVIOUS POST Previous post: Bridge Strike – Modern ‘River Raid’ on the Amiga is now ready to enjoy!